If you have a hankerin’ to go honky tonkin’ on Broadway in Nashville, you have to check out Robert’s Western World… it may be the only legitimate spot left. 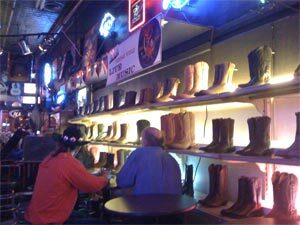 Bypass those urban posers at the Stage and enjoy a High Life while enjoying traditional country music and viewing the extensive selection of cowboy boots for sale on the wall. You won’t regret it, and you’ll gain instant street cred with the locals. This entry was posted in Entertainment, Vices and tagged Bar, Country, Cowboy Boots, Legit, Nashville, Western. Bookmark the permalink. I won’t buy a beer and boots combo from anywhere else.